This attractive landscape format book combines an excellent introduction to the stars and basic astronomy with a set of star maps, plus in depth looks at some of the stars featured, with a bonus section on the solar system. Amazon says it’s a hardback, but in fact it’s a paperback with a rather ingenious cover – you can’t tell from the photo, but the words ‘The Star Book’ are punched through as a series of holes that show the white paper of the next page beneath. Like many astronomy/space books, the cover lacks shelf appeal because it is mostly black, but at least there is some original thought here. 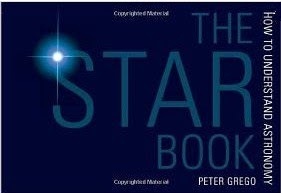 Unlike many books in this format which tend to concentrate on the pictures, there is a good deal of excellent text by Peter Grego, so there was no feeling that you were only getting the star maps and star ‘biographies’, something these days much more suited to an iPad or smartphone app. Instead, the opening 30 or so pages give a very good introduction that would be valuable to any beginning astronomer. Throughout the pages are on good semi-glossy paper, so the full colour illustrations are better quality than is sometimes achieved. Overall, this book was a very pleasant surprise. It may not be a typical, end-to-end read popular science book but combines genuinely readable, interesting and informative text with a host of practical maps and data. Good stuff.